Three months ago, I had a chance to come Binh Duong, which is one modern city of Vietnam, to visit my friends there. They were very happy and invited me one Best Vietnamese Food which is only exist in Binh Duong. 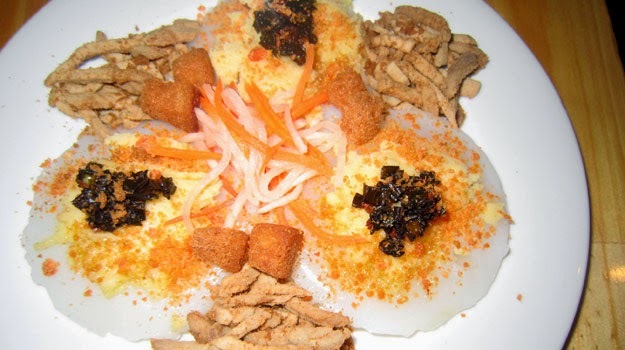 It is Pork skin bloating fern-shaped cake (Bánh Bèo Bì). It is the best bloating fern-shaped cake that I have ever tasted and I ate 3 dishes at that time. Pork skin bloating fern-shaped cake is delicious that some expat and local visitors come to Binh Duong to just eat and leave then. 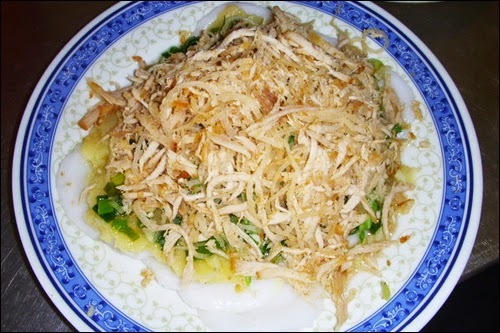 To make this Best Vietnamese Food, you do not need to buy the best quality of rice, the acceptable quality is ok. However, the process of making it is so difficult and takes a long time. So, someone said that Pork skin bloating fern-shaped cake contains the hearts and efforts of the bakers. Firstly, the rice is washed for many times to take out the dirt outside and mashing it for one night. Next day, the rice is washed one more time to take off its sour flavor and decorticating like the dough later. After that the bakers use the stone miller to press the water out. Finally they take the dried dough to make the cake. They mix the dough with the ingredient very carefully and the pour them into the small cup before boiling them into the hot water. When the cake is boiled, it has a beautiful soft white and attracts easily the eaters at the first sight. One more thing that makes this cake becoming the Best Vietnamese food is the makers add the green bean which is boiled in the middle of the cake. They look like the stamens of the flower. Finally, they put the pork skin onto the cake. 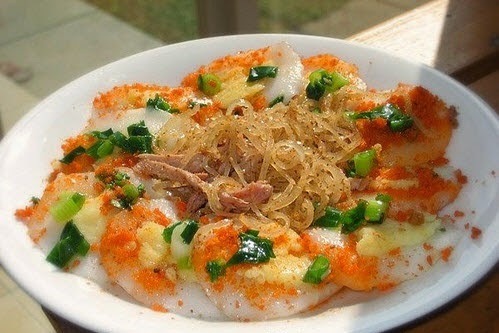 To sum up, if you eat this Best Vietnamese Food one time, I am sure that the one dish does not satisfy you. Are you planning to travel to Vietnam? Make sure you already take note this dish in your diary book before visit here. If you miss it when travel to Binh Duong Province, you will really disappointed. Hope you have a happy trip with family and friends.